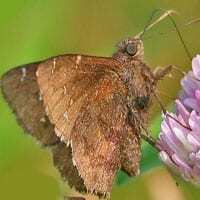 Upperside is dark brown; clear spots on forewing are small, triangular, and not aligned. Male forewing has a costal fold enclosing scent scales. Underside is brown with gray overscaling; hindwing has 2 dark bands.